Mercurial is certainly a label that even curmudgeon Bob Dylan would seem hard-pressed not to embrace. For his new album, “Together Through Life,” the rock legend surprises his audience yet again by re-embracing the sound of the roadhouse blues that first captivated his imagination back in the 1960s. Whatever contrivances are attempted before or after, Bob Dylan is an artist whose creations live in the moment. For a rock ‘n’ roll legend who has made evolution the hallmark of his career, his focus on spontaneity in the music-making process is arguably the only constant that links the iconic young folk singer of the 1960s with the craggy, Hank Williams-suited, electric-blues rover of the ’00s. Whether it’s during the one-night stands that he plays before thousands on any stage around the world or in the cloistered confines of a recoding studio with a cabal of musicians, Dylan commands that his songs must exist as mood and conditions permit. Rehearsals are for amateurs. Stage performances instead are a string of malleable improvisations, not perfect reproductions. Studio versions of his songs aren’t tightly-arranged templates, they’re snapshots. By the time the track is mixed, his latest would-be classic has likely mutated into something new. For most of his career, this philosophy served Dylan well. No other member of the classic-rock pantheon can claim such a seminal discography, nor manage the kind of multi-album renaissances that bring this inscrutable, hippie-era relic back into vogue. In recent years, however, the mercurial Dylan has battled his instincts and become increasingly deliberate, most notably in the studio. Years passed in between albums as he nursed his handiwork. The payoff for this adaptation was a trifecta of shockingly strong records that allowed the old master to launch and ride a stunning comeback in the winter of his days. Movies, documentaries and books have followed each recorded triumph. Album sales have never been better. Despite this positive turn of events, Dylan has now reversed himself again on his new album, “Together Through Life,” which witnesses the bard returning to his freewheelin’ modus operandi and with surprisingly exciting results. The album rocks with the blues spirit of an after-hours, accordion-laced roadhouse jam session. Dylan might be drunk with confidence or perhaps he has depleted his muse, but this idea of banging out a few songs on the spot is fraught with peril. The late-career flowering brought on by 1997’s “Time Out Of Mind, 2001’s “Love And Theft,” and 2006’s “Modern Times” has given rise to claim that we’re hearing rock’s only true genius returned from self-imposed exile. And while publicity momentum is on his side, Dylan has the herculean task of proving not only that these new cuts are good, but also that his comeback is still chugging along like an out-of-control locomotive from an old folk song. “I feel a change coming on,” Dylan intones, on the new disc, and this time, Dylan is talking about himself instead of the powers that be. Dylan camp insiders confessed to the press weeks ago that they were surprised he produced a follow up so quickly after “Modern Times.” According to reports, the record sprang from a session to track a song for an upcoming movie soundtrack and quickly expanded in scope. More than the speed of its delivery, fans might be concerned about “Together Through Life” by just glancing at the liner notes. Read it over and one can’t help but see famous names that should cue alarm bells. The roster is one that even the most ardent Dylanite might fear: Ol’ Bob is having a flashback to the dreadful ’80. Back then, Dylan seemed bereft of inspiration and lost in the wilderness. His once-luminous star was nearly burnt out. So the appearance of Mike Campbell of Tom Petty’s Heartbreakers on guitar isn’t initially welcome news. Petty and Campbell toured with Dylan as his backing band when was arguably at the very lowest ebb of his career. Another ominous guest is Los Lobos’ David Hidalgo, whose band enjoyed its greatest commercial success in 1987 with the “La Bamba” movie soundtrack. Lastly, Dylan enlisted Grateful Dead lyricist Robert Hunter to help him flesh out the rhymes for most of the new tunes. Hunter, who’s most famous as Jerry Garcia’s writing partner, has teamed with Dylan before, but their previous collaboration in the late ’80s (when Dylan was touring with the Dead) yielded two songs that don’t rank among the best of either man’s poetry. 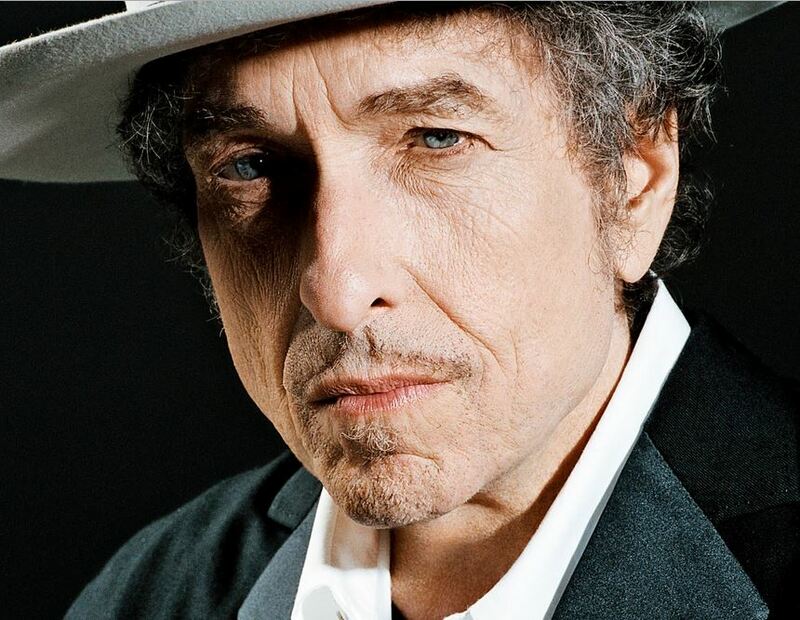 It was exactly his horrific experiences trying to record albums in the ’80s and what refuse subsequently ended up on vinyl that pushed Dylan to become a more methodical songwriter in the late ’90s. Like the other tracks on “Blonde On Blonde,” Dylan and Hunter mostly steer their new lyrics away from heady subject matter. You could say the pair is still writing what Dylan once called “finger-pointing songs,” but instead of gesturing toward social ills, these lyrics are comments heard by lecherous construction workers. Instead of deep meaning, Dylan is cruising for babes and wants to have fun circa the early part of the 20th Century. “Jolene” is a fun surge of ’50s swing that listeners can easily imagine expanding into a soloist’s showpiece during Dylan’s ongoing Never Ending Tour. Dylan’s croaking is the most gravel-ridden it has ever been. Campbell’s slide guitar, which often sounded otherwordly on Petty’s big hits of the ’80s, has never sounded so aggressive or more indigenous to the Southern music experience Dylan is reveling in here. Equally joyous, “Shake Shake Mama” is a boisterous smack of clunky Chicago blues. Campbell and Hidalgo’s electric guitars trade and sometimes share ramshackle riffs that roll over each other. Dylan, who has mostly traded his axe for an organ these days, lets his Hammond seethes below the guitar parrying. While love is on his mind, Dylan’s lyrical lustiness does cede time to his more romantic impulses occasionally. One of the album’s most striking songs is the “This Dreaming Of You,” which subtly recalls the gypsy-flavored, love-sick “Desire” album from 1975, except now Dylan’s voice is a seductive growl instead of the preening of a middle-aged storyteller. The new song’s amorous combination of Hidalgo’s accordion swells and Herron’s delicate fiddlework perfectly project the image of a kitschy Italian restaurant, with Bob and his lads playing the role of the lusty, intruding musicians who are intent on introducing atmosphere all over the patrons. Dylan’s delicate singing slowly winds its way around all the words, like he’s creeping closer to your table with each verse, his every phrase gently easing his thoughts into your life. The record isn’t without its defects. Some tracks just never rise above sounding like filler. “Life Is Hard” and “If You Ever Go To Houston” are bereft of a liveliness that seems to overflow on other songs. “My Wife’s Home Town” is just as monotonous — a 12-bar blues never before sounded like it could go on for a painful 684 bars — except it’s rescued by Dylan’s clever wordplay about his wicked woman. “It’s All Good” is the opposite. The lyrics are trite while the band’s uptempo groove try to break this song out of its rut. Signs that Dylan’s songwriting genius stumbles now and then shouldn’t suggest his comeback is slowing. His recent heralded albums weren’t perfect either. Rather, it was his enduring lyrical strength, the vivaciousness of the grooves and the clarity of his voice (pun intended) that fueled this renewed interest in his work. Many took him for granted during those dark years — because of his style, his voice, his mystique and his infamous musical unpredictability. If Dylan is doubting himself at all, “Together Through Life” should reinforce his faith in his ability to get with some hot-shot players and mix it up. He still has the magic and his moment will continue on. ©Copyright 2009 by David Hyland. All rights reserved. This material may not be published, broadcast, rewritten or redistributed. 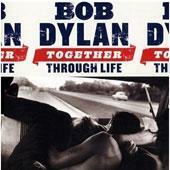 Tags: Bob Dylan, Donnie Herron, Mike Campbell, review, Robert Hunter, Together Through Life, Tony Garnier. Bookmark the permalink.